2013 ( US ) · English · Action, Science fiction, Adventure · PG-16 · 100 minutes of full movie HD video (uncut). MOVIE SYNOPSIS - Where can I watch it and what's the story of this 2013 film? You can watch After Earth, full movie on FULLTV - A thousand years after a series of cataclysms forzasen humanity to leave Earth, Nova Prime has become their new home. After a long mission away from this planet, the legendary general Raige Cypher returns with his 13 year old son, Kitai. But half an asteroid storm their ship breaks down and crash into the planet Earth, which is now a dangerous and unknown territory in which all forms of life have evolved to kill humans. As Cypher was injured, Kitai must travel hostile world in search of rescue beacon. All his life he wanted to be a soldier like his dad, and now he gets the chance to fulfill your wish. 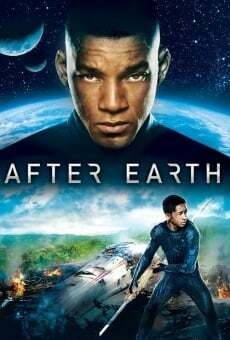 You are able to watch After Earth online, download or rent it as well on video-on-demand services (Netflix Movie List, HBO Now Stream, Amazon Prime), pay-TV or movie theaters with original audio in English. This film has been premiered in theaters in 2013 (Movies 2013). The official release in theaters may differ from the year of production. Film directed by M. Night Shyamalan. Produced by Kwame Parker, Caleeb Pinkett, Jada Pinkett Smith, John Rusk, James Lassiter, E. Bennett Walsh, Ashwin Rajan, M. Night Shyamalan and Will Smith. Screenplay written by M. Night Shyamalan, Gary Whitta and Will Smith. Soundtrack composed by James Newton Howard. Commercially distributed this film: Walt Disney Studios Motion Pictures Finland, Home Box Office (HBO), Feelgood Entertainment, Walt Disney Studios Sony Pictures Releasing (WDSSPR), Sony Pictures Home Entertainment, B&H Film Distribution, Columbia TriStar Warner Filmes de Portugal, Universal Pictures International (UPI), ACME Film, Manfer Films, Distribuye Movie, United International Pictures (UIP), Continental Film, Cinematográfica Blancica (CB), Columbia Pictures, Sony Pictures Releasing Canada, Sony Pictures Filmverleih, Andes Films, InterCom, InterComFilm, Sony Pictures Entertainment, Acme Film and Sony Pictures Releasing. Film produced and / or financed by Columbia Pictures, Blinding Edge Pictures and Overbrook Entertainment. As usual, the director filmed the scenes of this film in HD video (High Definition or 4K) with Dolby Digital audio. Without commercial breaks, the full movie After Earth has a duration of 100 minutes. Possibly, its official trailer stream is on the Internet. You can watch this full movie free with English subtitles on movie TV channels, renting the DVD or with VoD services (Video On Demand player, Hulu) and PPV (Pay Per View, Movie List on Netflix, Amazon Video). Full Movies / Online Movies / After Earth - To enjoy online movies you need a TV with Internet or LED / LCD TVs with DVD or BluRay Player. The full movies are not available for free streaming.